These days I live in Sugar Land, TX. The family and I feel like we are on mission here. I was laying in bed this morning not sleeping because our dog was crying. That is another tale altogether. So I start hearing train horns and thinking that they seemed loud today. Now I have spent time in three cities in Texas and slept in about 10 hotels or houses. Only one of them was right next to the tracks (yes Eric, your apartment), but in each of them I remember hearing trains. I’ve come to the conclusion that is just a fact of life in Texas, or at least in the areas I have been. Our current house is 3/4 of a mile from the tracks as a crow flies based on Google Maps. The train doesn’t head toward our house and the 3/4 of a mile is the closet point the tracks come. So why do we need to hear the horn? You would think that some one could develop a more directional horn that doesn’t spread the sound 3960 feet to the left and right of the train. I have not been woken up by a train at this house, but Trisha and I are pretty sure the conductor is using the horn to keep himself awake. Today was an interesting day. The best part of my job is that I get to work with volunteers. About two weeks ago, I got an email from one of my long time volunteers asking if I would speak at a career day. He is an assistant principal at a middle school and was looking to fill some slots. When a volunteer who has served in the tech ministry for a long time gives you the opportunity to help him, you jump. So I spent the morning speaking to eighth graders about my job as a technical producer and a web developer. Certainly not the way that I had planned my first day off in three weeks. Each time I think that I have other things to do, God lets me know where I need to be. I was paired up with a graphic designer and we spoke to six different groups for about 25 minutes each. Being that my week was crazy, I didn’t have much time to prepare my talk. During the first session, we each gave a short description about our jobs and then asked for questions. The question was asked if there was anyway for them to start learning about graphic design, web development or technical production. What a great opportunity to invite the kids to church and become a part of the tech ministry! That same opportunity presented itself for the remaining five classes. Just where I needed to be. This weekend we hosted Planet Wisdom. Anytime we have a outside event it means work. In some cases we have to totally clear the stage. So you have to ask is it worth the work that is involved? In the case of Planet Wisdom, I would say yes. This event was lots of work and as usual was scheduled on my two days off. We had to clear the center of the stage as well as move some of the pews to fix their equipment. Load in and out is taxing and then being that this event ended on a Saturday evening we had to reset the stage for Sunday morning. I think that I ended up in leaving at about 10 pm. So was is the value? Just the fact that 900 students were given the opportunity to hear the word and grow in their faith is value enough. But events like this can also be a learning experiences as well as spark some creative ideas. This event had some good lighting as well as some creative video shots that I might have to try in some future services. Over the past week or so I have been checking out the site visualworshiper.com. Dave had sent me the site and I was very impressed with Camron’s use of projectors for architectural projection. Come to find out Camron has worked with Planet Wisdom for a while and I had the opportunity to meet him and get a better idea of how he created such cool stage looks. 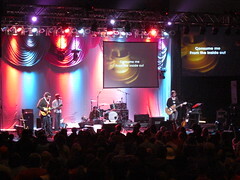 I still am planning on getting up to Dallas and attend Irving Bible Church and see the projectors in action.